a state of emergency and is evacuating thousands of Chinese citizens in Vietnam, Ukraine is teetering on the brink of self-implosion from civil war and the death toll in Syria has just reached 250,000. All of these events have occurred in different parts of the globe and have a complex background to them, yet there seems to be a common underlying theme. Through some means or another, the unrest can be traced back to patriotic and nationalist sentiment leading to a divide between people and ultimately war, where the ruling governments lay at the center of the storm. At present there are no less than five major patriotism-fuelled civil wars in addition to dozens of smaller wars across the globe. Wars have a proven track record of forcing out change in nations; everything from culture to technology, even the religiosity in quantity & context has been changed and deformed at the boot heel of aggression. Yet patriotism and nationalism endures, in fact in the current climate just like at the end of the great depression, patriotism and nationalism thrives. This article posits that patriotism and nationalism are two sides of the same coffin, where patriotism is simply the word of the day. Like cancer, they have their own breeding grounds – war, furthermore they have a tendency to fool internal systems appearing as the familiar friend but to spread rapidly, where if not caught early can lead to the downfall of man. After 9/11 the US in a breath-taking move of hypocrisy enacted a range of liberty strangling laws to form the patriot act. 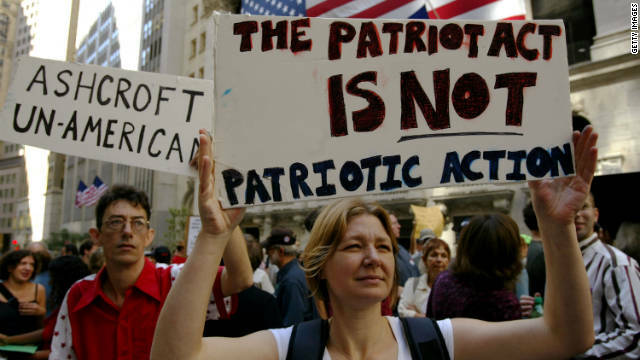 The pinnacle of irony being that, the Patriot Act itself led to those identifying themselves as “patriots” or within the “patriot movement” as suspected domestic terrorists . It is very common for nationalism to spring fourth negative emotions, with words like fascist and dictatorship quickly loading into the vocabulary chamber. The world patriotism however is used to inspire, with things like the American patriot ‘a true American’ in the war of independence or patriot missiles – the last line of defense.Some argue that the word patriotism is used in a defensive context, yet it is not a coincidence they are usually related to war (with foreign aggressors); this makes it easy to identify the ‘good’ and the ‘bad’. Furthermore the assertion that patriotism is solely a positive entity, where values and the way of life is at the heart of its virtue is easily rebuked; the minute you leave the country to work regardless of your feelings, you are nether the less an expat. The potency of patriotism in its manipulation of reason and logic lies in one of the most solid philosophies of social psychology – social identity. The key principle is that people need to identify themselves as someone and as part of something, which gives them a sense of belonging and thus security . This leads full circle to the inevitable consequence that, if we identify with one group, we must then distinguish ourselves from other groups. This is where nationalism and patriotism are one. Ronald Regan once said ‘if we should love our country, we should also love our country men’, does that also include criminals and serial killers? Of course generalization is implied here which happens to be another problematic bi-product of patriotism. It is much easier to see the enemy as a distant singular entity, as opposed to considering the vast spectrum of people that exist there, bakers, teachers, mums, dads, and if you like dictators. In this way, painting a nation with the same brush, means less empathetic effort is required and is morally less intensive, but it is a numbing our senses and ultimately a betrayal of our human nature. The generalization that ‘our country’ is good and we should love it implies an element of emotional isolation from other countries and thus their people, unless of course the emotions are negative. It is important for us to realize that we live in for the most part, a ‘mono love society’ where we both love and belong to one partner, one family, and inevitably one country. From this angle the possibility that a patriot would love another country seems remote at best. This effect ensures that our most positive emotions are bound to our homeland. As for other nations our moral mind is closed for business, further aggravating the ability to see ‘foreigners’ objectively. The generalizations are quite apparent in the US, where they have consistently rated as one of the highest nations by measure of patriotism . From the range of statistics on this topic, around 30 to 55% of Americans believed that Barrack Obama was of Muslim faith, from surveys taken during the time of his first term in office. Additional studies show that over 15% of Americans are unable to distinguish more than two countries in Asia, Europe or Africa. The USA is not the only country that follows this trend; in fact it is long known that where patriotism is high, international awareness and empathy for people from non-allied countries are low. The famous quote ‘we fear what we don’t know-it’s natural’ suggests that as patriotism forces down our awareness of foreign nations and people, then fear and fear mongering is inevitable. Fear mongering is extremely advantageous for those at the helm, the Space Race which is argued to be a positive product of patriotism, was simply fear driven expenditure that originated with the launch of the USSR’s sputnik satellite- a hollowed out intercontinental ballistic missile. More recently fear mongering has led to the invasion of Iraq. the excuse that there was a threat of WMDs (Weapons of mass destruction) was quickly disproven, to the expense of the tax payer and the lives of many. In fact originally the United States had no evidence at all; the trigger for the invasion was by circumstantial evidence presented from the British intelligence agency. At the bottom of the patriotism cesspit lays one of its mutant offspring, birthed by fear and raised by ignorance, racism. Some notable examples include Jim Crow laws, ethnic cleansing to current situation of civil wars on multiple continents. As not to play into racisms favour, no more time will be dedicated to it, instead the focus will continue on the root-cause that is patriotism. A significant driver of the German war machine in World War 2 was the fusion of solidarity with patriotism. This was largely ignited by Adolf Hitler and his party, successfully channeling the frustrations of the day into psychological ammunition he could wield for aggressive land reclamation measures. Germany was in a state of prolonged depression, restricted both from the financial downturn, high unemployment and the Versailles Treaty – a treaty which restricted Germany’s right to acquire land. The treaty was partially used as a pretext for Germany to justify forceful reclamation of land where German speakers lived. Hitler would deliver his rhetoric in beer Gardens around Germany which made for easy pickings, as a lot of the attendees were laid off work men from the recent depression . Festivals and music concerts were organized, here Hitler would be preaching to the choir, literally. The idea of protecting a nation’s speakers in a foreign country with invasive force is a common reoccurring theme, the latest in which is characterized by Russia’s annexing of Crimea. Hitler used the ‘harsh’ limitations that were set against Germany in the Versailles Treaty as a pretext for Germany’s right to acquire land where German-speaking people lived. Germany successfully used this reasoning to envelop two entire countries without even starting a war. 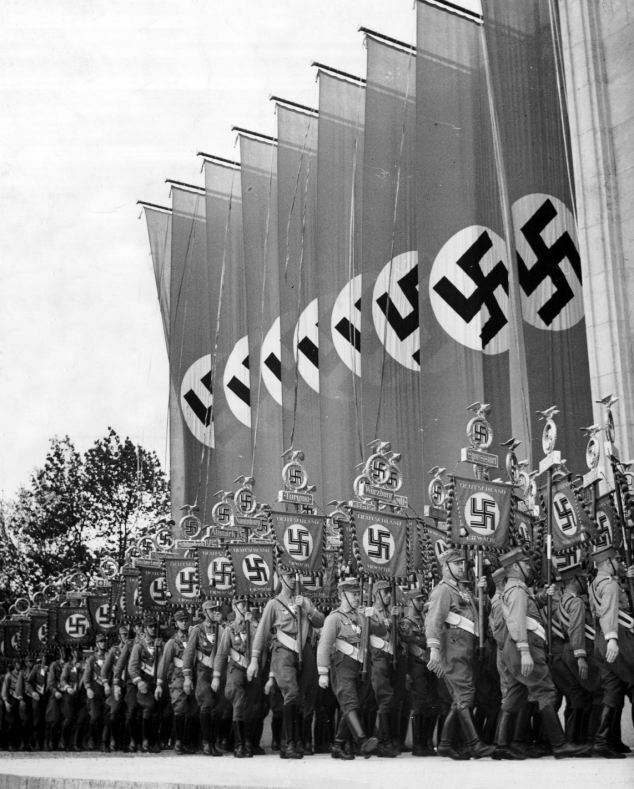 Not only nationalism but patriotism was the catalyst for which the fascism was spread, loving your nation and their beliefs, meant loving the status quo which at the time was the Nazi regime which included spreading that ‘love’ to German speakers in bordering countries. The Falkland wars has been likened to two bald men fighting over a comb, yet today we see almost the exact same incident with the Senkaku/ Diaoyu islands dispute- a set of tiny islands claimed by both Japan and China. Both cases involve disputes where two sides lay their claim to the land. But the islands are more about symbolic pride than a practical necessity, where the incident grips the nation, movies are made songs are sung and hatred brews. They set the scene for the nations to perform a show of strength, with aircraft carriers and battleships acting as the mascots, public support and media attention have acted to further solidify patriotic sentiment. Here patriotism completely overwhelms and clouds logic and even the mention of diplomatic solutions such as sharing is considered Heresy. Of course like cancer, patriotism manifests itself pretty much anywhere it can; it is not constrained to the battled field. Football matches and the World Cup has been an frequent venue for the public to carry out their flag waving with the side serving of bigotry and racism being spouted out by mindless drones, occasionally ending in violence even death. There is always something on the news related to clubs being fined for the behaviour of their fans relating to racial abuse. Sports are an obvious example, but as said, patriotism-fuelled hatred is everywhere. The Eurovision song contest, where music acts represent their nation has long been slated for the bias in how countries vote. Nations tactically vote so their neighbours can perform better, and that their rivals can be prevented from success. This may seem trivial, but since the votes are issued from the public, and as the show gets high ratings, it’s a safe bet to say there is still a large divide in Europe. It usually ends up in tears with countries blaming others and the occasional racist scandal emerging, even the British presenter Terry Wogan received calls to stand down from foreign viewers. This was due to his pent up patriotic emotions bubbling to the surface. In essence patriotism is a tool, wielded by those in charge to distract our human nature and supress our emotions like love, compassion and empathy from reaching people in other countries. No matter how the government and media sell the case for patriotism to us, we should remember that patriotism-fuelled belief is the reason why otherwise potential soul mates, best friends or partners could end up despising each other, simply because they are born in another place. Einstein once said ‘nationalism is an infantile disease. It is the measles of mankind.’ This article compliments his view by asserting that patriotism is the cancer of mankind. 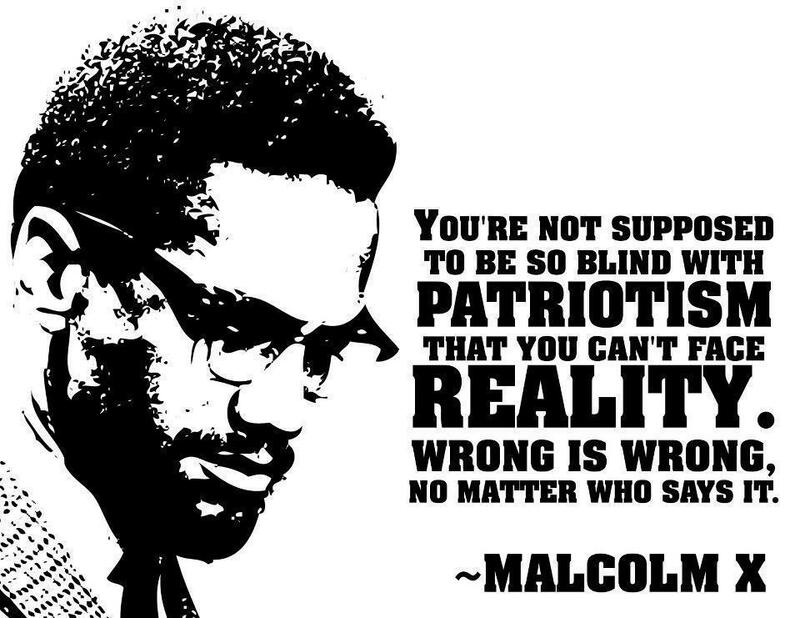 As patriotism spreads, it deceives and uses our own feelings against us, acting as a smokescreen for logic, and moving the moral goal posts to suit its agenda. Even if patriotism once had origins in a purely positive nature, that nature is long gone. *Adam McMurchie is a regular writer of Alochonaa. He is based in Edinburgh and currently works in the financial sector as a subject­ matter expert (SME). He holds a degree in physics and is a seasoned translator in multiple languages. Sorry, I can not agree with this article. Last 300/400 years most of the countries prospered and succeed by thinking patriotic and competitive way (when most of the universal religion-Islam, Christianity & Buddhism were getting weaker in spirit and proper practice) . As long as the competition is healthy and right-worthy it can bring good achievement. But jealousy and revenge could jeopardize positive vibe & ambition of the patriotic movements. Most of the EU nation and America gained and achieved more by engaging in a healthy patriotic competition. Except Japan and other Asian countries. They had fanatic patriotism. Thank you Abdur for the feedback, that is appreciated. From a bit of research I found, that most historians point to the recent progress in the past 300/400 years being a result of scientific advances stemming from Newtonian physics and the formalization of the scientific method, Copernicus and Galileo. These people broke through, even although religion had the governments at stranglehold. As I mentioned in my article, patriotism-fulled competition brought out the space race allowing the USA to make advances and land on the moon. However that was simply a tool from the government to get further support, the real reason as agreed upon by many eminent politicians was simply the threat of an opposing nation being more advanced. Sputnik shook the US administration to the bone. Also your point about jealousy and envy being a big problem is exactly right, unfortunately though as in my article, I believe that patriotism is the root cause for jealousy and envy in the first place. Look how patriotism has torn apart Ukraine, and many other hotpots around the world. Also there is another more important but less practical consequence of patriotism, it is not simply just a driver of wars and aggression, there is a bigger issue here, which is the effect patriotism has on the psyche. It causes us to segregate ourselves from others, but from a hierarchical point of view where we are at the top, it does this emotionally too. A recent example would be, the Philippines tragedy, thousands died, support and ships came from all over the world. Yet their closest neighbor China sent nothing, they were ridiculed by neitizens and government members alike, due to their history of patriotic competition. Still I think, To be an universally accaepted respected leader, A leader has to probe himself/herself to His/Her country or nation or people. Great works and actions starts from the home.